Mr. Sael Al Waary, Chairman of Arab Financial Services (AFS) and Deputy Group CEO of Bank ABC, urged banks to take advantage of the current financial disruption and collaborate with FinTech companies to sustain and expand their business. In his opening address at the 2nd Middle East and Africa FinTech Forum, entitled Beyond Disruption, held in Bahrain today, Mr. Al Waary illustrated the elemental shift in the way financial services industry is now responding towards FinTech. “Banks have shifted their mind-set and are viewing FinTech as an opportunity rather than a threat. More and more banks are embracing FinTech and are catching up very quickly,” he said. Mr. Al Waary added that many traditional or legacy banks are still responding with a defensive strategy by creating “mobile only” banks or “app only” banks, leveraging their existing infrastructure and regulatory status to enhance the customer experience and attracting new customer segment. On a related front, he explained that central banks around the world are getting increasingly supportive of FinTech innovation and are establishing regulatory ‘Sandboxes’ to enable firms to test new financial products with real customers. “Almost US$100 billion has been invested in FinTech globally since 2010. In 2017 alone US$ 27.4 billion was invested, an 18% increase from 2016, driven by the surge in USA, UK and India,” said Mr. Al Waary, highlighting the rapid increase in financial services startups in MENA and leveraging technologies and innovation to tap in the un-banked, underserved and unsatisfied customers. 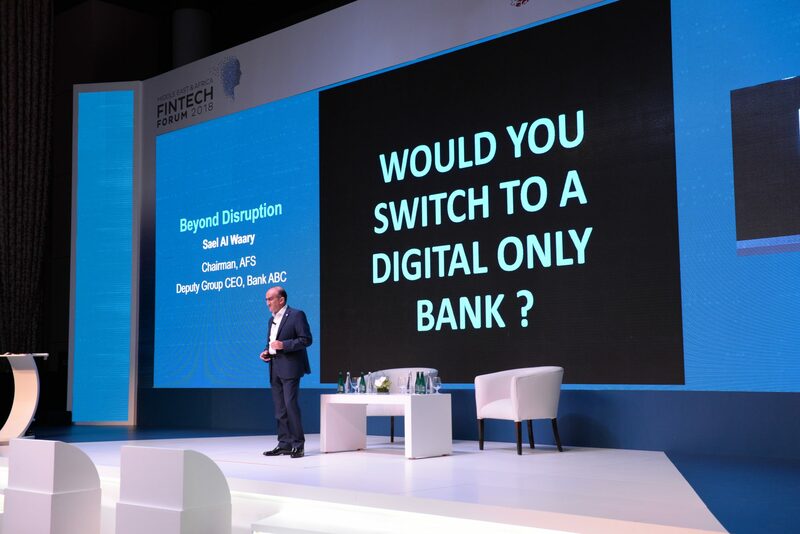 He also noted that going ahead, customers will set the agenda to shape the future of banking, reiterating Bill Gates’ words – “We need banking but we do not need banks.” In addition, he foresees an explosion of frictionless payments in the region, as initiated by AFS and Batelco’s bWallet service in Bahrain. Such wallets will soon be launched in Oman and Libya. “While all of this is happening, Artificial Intelligence (AI) will find application in almost all areas of banking, from front-office, to credit scoring to even advisory… and cloud banking will bring more scalability and agility at a lower cost,” said Mr. Al Waary. He predicts that Blockchain technology will soon become mainstream, revolutionising banking operations, and financial inclusion for the two billion unbanked people around the world.